Thanksgiving came and went, and a big wet wool blanket got thrown over Winter’s head. Weighing it down was a slew of Big, Important Adult deadlines and Real Adult Life Expectations, emails shouting You Have A New Bill From Bank of America Vehicle Loan!, final exams and application fiascoes. The pace has been steadily swift. I liked it, though. And there were reasons to feel joy despite the drear, like holidays and visitors. It’s been helpful to feel like winter is flying by, rather than dragging on. Still, I’ve got a mild case of the Mid-January Crazies and suddenly I’m in serious need of an exorcism. I need a witch doctor to release the knots in my neck and spine, the frozen-to-the-bone chronic coldness, the uncertainty and instability and flightiness. All my wiring is a bit crossed. In attempting to solve minor daily bumps in the road, I frequently arrive at conclusions like: I should drive to California RIGHT NOW. So far, I’ve mostly kept the Crazies in check with compromises. 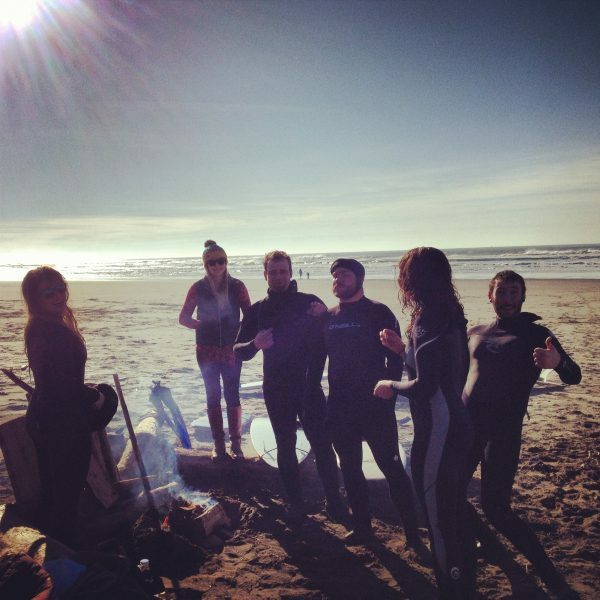 For my birthday, I gathered a few of my closest friends into two packed cars and we drove to the coast to surf in the icy waters of the Pacific. A mini escape, with unbelievably good results. The kind that restores faith in miracles. I thought it would tide me over for another longer spell. But that’s where I messed up—it was too good. 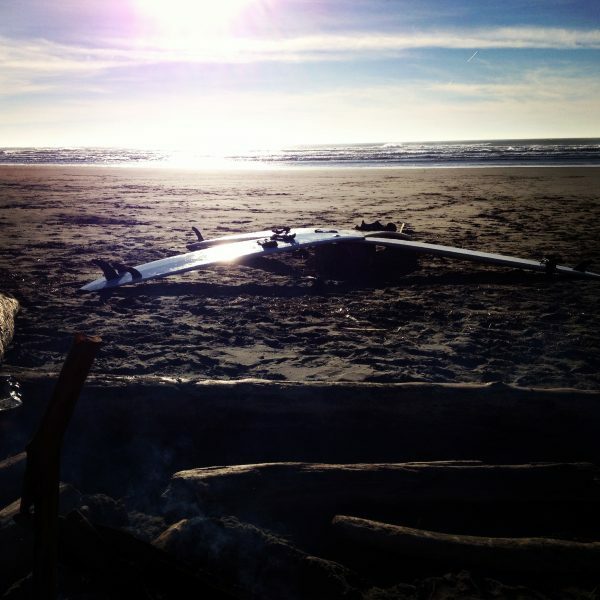 The joy of being thrashed around in the waves, our faces numb and lips salty, was a mistake. It trampled the barricades, broke the levee, ripped off the wet wool blanket of Big, Serious Adult Expectations and left us naked to the playful whims of the tide and the wind. Remember this? shouted the ocean, hurling itself into our faces as we laughed happily at the beating. THIS is EVERYTHING, it scolded gently, and tossed our ragdoll bodies into the whitewash. We came home and couldn’t feel the same again. Now I’m fighting off urges to drive toward the Cascades and just keep on going. The voices are a whisper coming out of the past, cajoling urging pleading with me to give in. Go on, they say, drive on, skip the exit, miss the turn off, just keep driving until the interstate becomes a different number and another country code clicks into your phone, then throw that stupid brick out your rolled down window as the cold air rushes into your face, and go even further. Ditch the car by the side of the road, hitch to the nearest bus stop or train station, keep going all the way until you reach the cold, dark Atlantic, then rip off your clothes and jump in the water and swim for the far shore. Don’t worry about the destination, just run run run and keep on running. So on Friday, I tried to appease the voices with a weekend trip to my parent’s house. 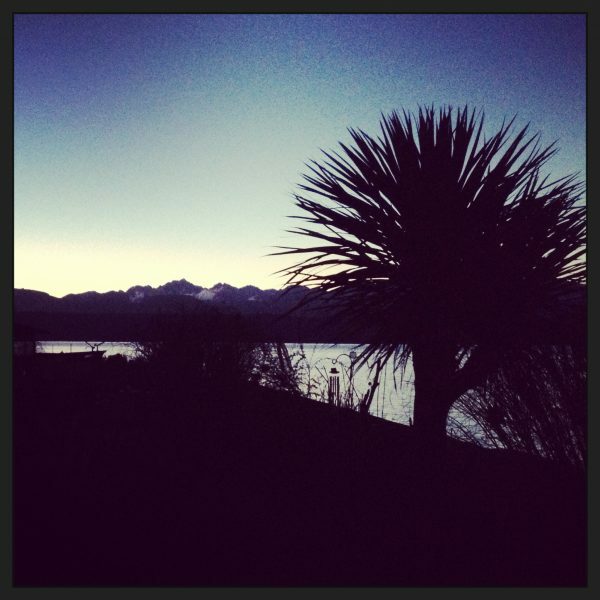 Their patio touches the Hood Canal and looks out at the Three Brothers. It’s my easiest quick-fix escape and usually does the trick, but this time the Crazies wouldn’t pipe down. My mother did her best to listen, console and help me process the Big Real Adult Life-induced stress. And then for why-not’s-sake, she poured more coffee and handed me a dog-eared paperback. 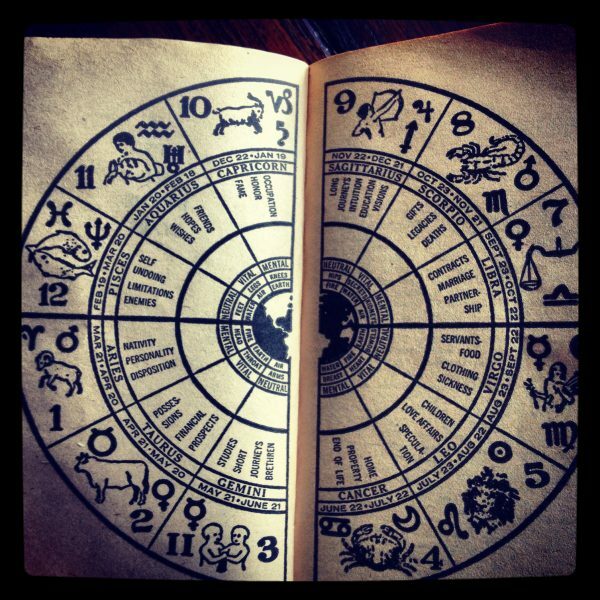 I’d noticed it on our bookshelf many times as a kid: an astrological guide to the Twelve Signs of the Zodiac written by an actor-stockbroker-radio station owner named Bruce King who made it big exploiting the wisdom of the stars under the name Zolar. It seemed perhaps not the best resource for advice, particularly given my own lack of grounding, but I figured I hadn’t much to lose at this point. I appreciated his apt comprehension of my constitution, this Zolar, but it wasn’t exactly a revelation at age 28. Not wanting to read more about how the Aquarian Wife is doomed to experience difficulty in finding lasting matrimony, I packed up my computer bag and drove into town. Poulsbo can be a bore, but at the right time it can also be a nostalgic and cozy and perfectly quaint bore. I had work piling up, and hoped I could tap into some quaintly boring productivity. In the cafe across from the marina I typed away until the sky outside faded into dusk. 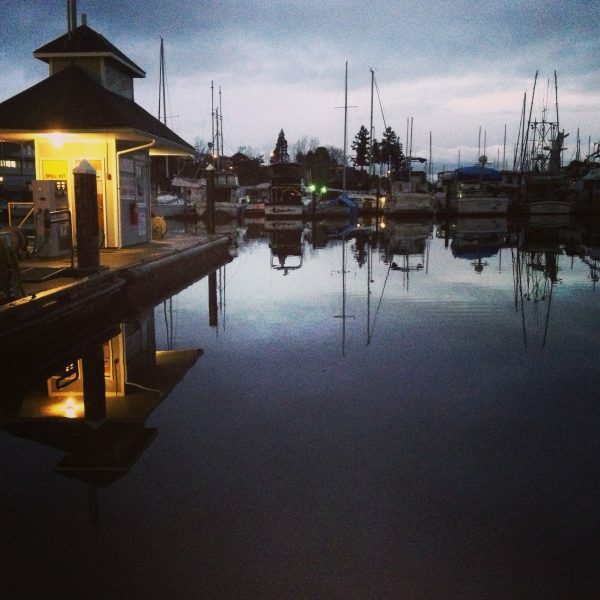 Lights from the dock posts and a tiny gas station for boats glowed soft yellow in the still, purple twilight while the sailboat palindromes sat perfectly motionless atop a mirror of silent harbor water. The stillness was overpowering. I walked out to the far end of the empty dock, the brooding promise of the sea and the romantic loneliness of running away tugged at me again. Hush, I said to myself. You can’t go now. You have to work. You have to find a better job. You have to figure out how to get some health insurance. You need to go to the dentist. You need to figure out how to pay for school in the fall. You need to do your laundry. You need to take a shower. Besides, where would you go? Appropriately, Sara called. She and our friend Milo were on their way to the Strangebrew festival in Port Townsend and I needed to come along, she said, promising music and dancing and free beer and single men. It sounded perfect. But I also had a splitting headache and a hard time extracting myself from the mud pit of indecision. Curling up in a ball with my eyes shut sounded more reasonable. I said I’d think about it and drove back to the house. A bit later, Sara texted. A final attempt to coax me out: Milo says just eat the oyster. I don’t know. Please come. He was reminding me about our ocean trip. The joy, the letting go, the everything. I looked out the window at the full moon that had now risen and suddenly grew tired of my boring self-pity party. Music. Dancing. Beer. Men. All free, all night. What was I thinking?? Eat the damn oyster. I packed a bag and jumped in the car. After crossing the bridge to the Olympic Peninsula, the highway turned north toward Port Townsend. Fog swallowed me whole as I passed low-lying farm valleys from Ludlow to Chimacum, in between stretches of highway swathed in moonlight that illuminated Douglas Fir silhouettes against a backdrop of black, silent water. Finally, the rotting stench of the paper mill greeted me and I spotted the lights of the port marking an otherwise invisible boundary between land and sea. Twisting in my seat to gape at the moon, I felt the logic of the witching hour take hold: I didn’t have to be anywhere the next day. I was already halfway to the ocean. Maybe I could just keep going until I had a reason to be back. California, Colorado, Mexico. I could go anywhere. I took stock of my supplies. Between the back seat and the trunk, I located a head lamp, snowshoes, climbing gear, two changes of clothes, a cliff bar, a shovel, soccer cleats, Italian leather moccasins, three books, and half of a First Aid kit. Once I met up with Sara and Milo, I’d have a sleeping bag too. Not bad. I had options, and a credit card. But first, there would be dancing. 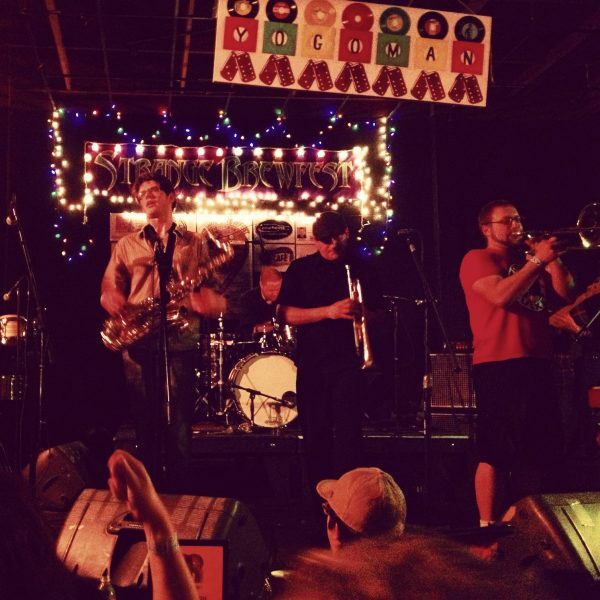 I located my friends and the Polyrythmics inside an American Legion meeting hall packed with beer and gyrating hippies and the kind of sticky floor upon which you hope to drop none of your belongings. Then there was another bar with an open tab, and another band and more dancing, shots of cheap cinnamon whiskey, my best girl by my side, and a collection of delightfully handsome and good-spirited young men who make up the Georgetown brewing team. These boys took great pride in doing their part to keep us laughing and spinning in the center of the floor. Milo refused to let me sit down for more than 30 seconds. I salsaed and Shakiraed my way from the arms of one handsome brewer to another and felt lighter than I had in weeks. In the dead-on words of Zadie Smith, “on that dance floor I was joy, or some small piece of joy, with all these other hundreds of people who were also a part of joy.” In between twirls, I’d catch Sara’s eye and see her throw her head back in laughter, a tornado of joy. After last call, they turned the lights back on and turned us loose, spilling us out into the street where we gulped cold, clean air. At the hotel we decomposed into a chattering, half-clothed heap of thirteen bodies wrapped in blankets on the floor, strategically placed in between pieces of furniture and piles of belongings, heads and limbs pointing in all directions to fit everyone in the room without injury or insult. Two-dimensional Jenga. Four hours later, I woke up in my sleeping bag to the light of 8am clouds and the tune of loudly snoring boys, congested and out cold. I tip-toed into the bathroom, washed my face, put on real pants and slipped out of the room. 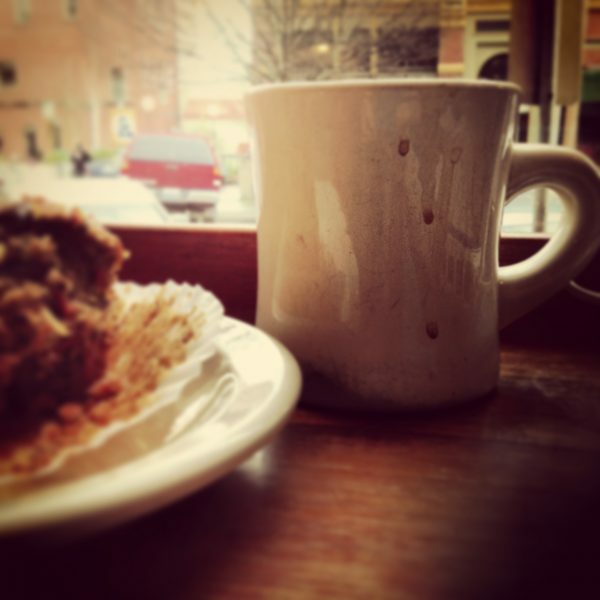 At a cafe, I found a window bar stool, strong coffee and sobering daylight. I tried to work, but the internet connection couldn’t make a commitment to functioning. Whatever, I sighed. Me too. I stared at the tendrils of steam rising up from my americano, feeling stuck again. 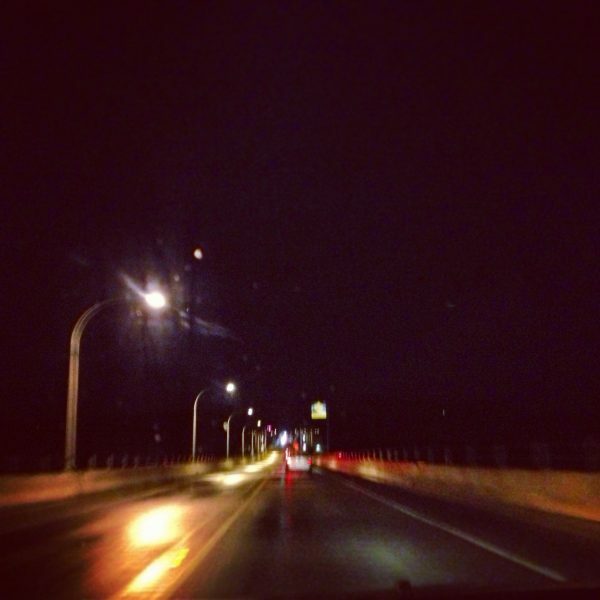 During my drive up in the moonlight, I’d talked a big game. I had granted myself freedom to be wreckless-with-conditions. Everything had seemed possible in the nighttime, but now I felt less sure that I could do it. I also didn’t know, geographically, where to go next. I felt myself being drawn east, to the mountains, but I didn’t have anyone to call for a roof and a bed. Sara woke up an hour later and found me. 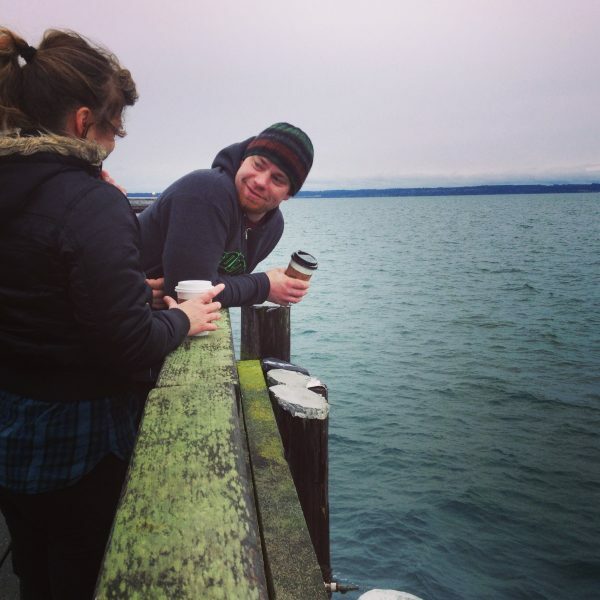 We took our coffee across the street, collected Milo, and the three of us walked out to the pier to stare at the Cascades and the grey-green water and the steel-colored sky. Together, we pieced the night’s events back together and wondered what comes after the joy tornado. Where did any of us think we were going? What was next? It didn’t matter, we decided. Next would find us. All we had to do was choose to eat the oyster or not. Thank you for this post. You are one excellent driver of this time machine. I haven’t been to most of the places you mention, but I seem to recognize landmarks. Over there between leave-takings and Poulsbo is a guy your age walking back to an apartment in Chicago in the dead of winter when he was absolutely free but no one cared. Between grad school and Kabul is a 31-year-old waiter in a pizza place on Polk Street in San Francisco with no idea of what he would do next. Your post brings it all back, as I’m sure it would for many of my generation when a thousand weblogs wouldn’t touch us. Because of your writing, and only writers know what that means and how hard-won that communication is. Many roads. And what a relay race passing from my generation to yours! Just working it out, going on faith a lot of the time. I think “things work out” simply because people keep going until they do. Hey, thanks for the trip. And as I told my daughter once, keep the faith. All roads lead to a place inside, and your place is a rich one. I’m not really sure how to properly thank you for these words, but then I can see that you know how much it means to have the nod of another writer — especially a real one! I’m humbled and grateful, and I hope that I can continue to live up to the honor of your compliment. Thank you for reading!